In the forest of oblivion, Indianostrum began clearing its path guided by their instincts. Lucky where they, for they crossed the paths of great masters right at their onset. They became rich by collecting Time from the field of Universe and spent them generously on ephemeral creations. Every time they slept they lost one among them and every time they turned back they found a new one walking besides. In the dark, disguising themselves with the costumes borrowed from ghosts they stealthily enter the reality to speak to the people. People otherwise so greedy are so friendly with them believing they are not humans. With the people, they chat and laugh, cry and share, sing and dance. When they stop, they realize, the houses are empty. When they stepped in, the empty houses melted in the air. It is then they remembered they are walking in the forest of oblivion. 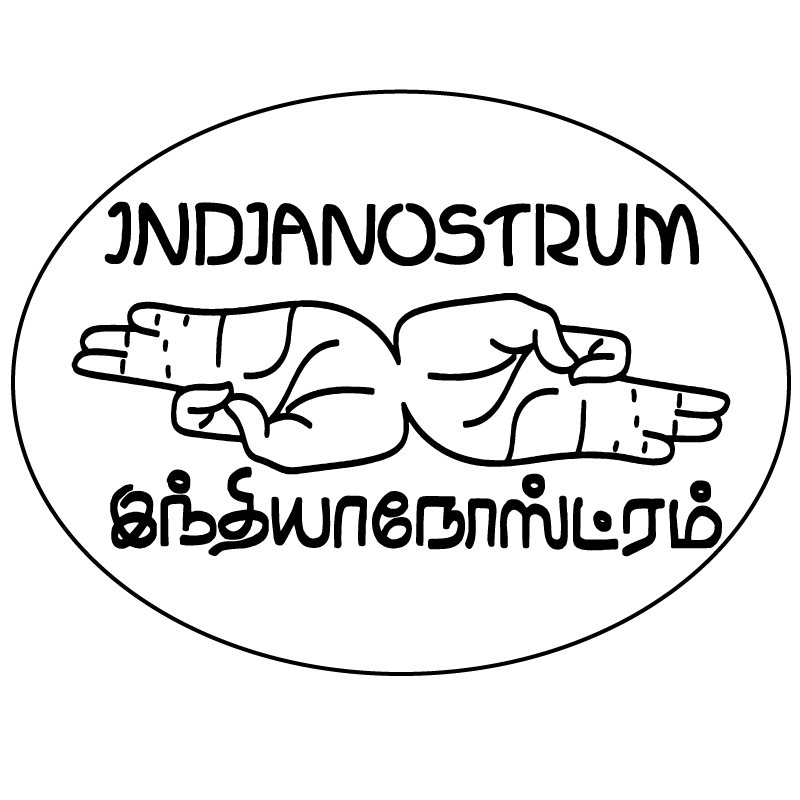 Indianostrum Theatre is a theatre company located at Pondicherry. The 11 year old theatre company was founded by Koumarane Valavane along with few actors who were ready to pursue theatre sincerely. In its initial years though we face constant difficulties to establish a professional Theatre company, through the regular support of our masters, our well-wishers and the public witnessing our plays, we were able to travel these many years and now we have a small Theatre space for the company at Pondicherry. Indianostrum’s core aim is to expand the role of modern theatre in the cultural life of the country, by developing new modern texts, finding the specificities of Indian modern theatre, exploring its relationships with traditional forms and transcending political, social and historical divides. Like a farmer needs his own piece of land even if it is small to do farming, a space to work is mandatory for an artist. In our country, where contemporary theatre is still in its infancy, where practising theatre is considered as a taboo in many parts, where the very name “Theatre” creates the image of cinema theatre in the people’s mind, we strongly felt the need of a space (a theatre space) where the artist and people can meet each other. “Salle de Jeanne d’Arc” also called “Pathe-Cine Familial” – an 80 year old French Cinema Theatre with a cemetery and a school as its neighbours, crossed our lives at the right moment infusing fresh oxygen to Indianostrum when we were at the verge to cease without a space to work in 2011. Here, we should thank Rev.Father and dignitaries of Our Lady of Angels Church, who had agreed to provide the “Salle de Jeanne d’Arc” to us when we went with the request of converting the Cinema Hall to a performance theatre. On 1st January 2012, Indianostrum stepped inside “Pathe-Cine Familial” carrying broom sticks, paint brushes and dreaming eyes. Sadanam P.V.Balakrishnan, Gave life to our newly built stage through his performance on March 28th. In 2012, we managed to have around 60 public performances at the theatre. 2013, was a critical year both for the troupe and theatre. While troupe was struggling to strengthen its team, Theatre suffocated without enough performances. As in the Greek stories, where one tragedy leads to another, a major fire accident hit the Theatre at the dawn of a Children’s performance (10th December). When we stepped over the burnt remains floating in the water gushed out by fire dept., our eyes were looking back for the dreams with which we entered in 2012 for we know we need to begin again. This time it was not only us who tried to re-build the theatre but a massive force formed by the people, friends and artists was marching before us to bring Theatre back to life. They made us realize this Theatre not only belong to us but to every one of them and our duty here is to maintain Theatre alive by connecting it regularly with the public. Koumarane Valavane, a Franco-Indian, who left to France in his early years for his studies, started practicing theatre at very young age. In the University of Marseille, he along with his friends created a cultural association named “centre culturel de Luminy ” and made theatre as its primary element. After completing his research in Theoretical Physics he came out of the University and founded his own Theatre Company “Natya”. And before returning back to India in 2006, for 3 years he worked as an actor at Theatre du Soleil, the renowned Theatre Company in Paris. With the rich experience of Contemporary Theatre gained from France, Koumarane returned to his home with a decision to continue exploring Theatre at Home. There he met few young people passionate about acting and his thought begun to spread its roots. This small group connected by the passion to do theatre, decided to form a Theatre group and created Indianostrum in 2007.